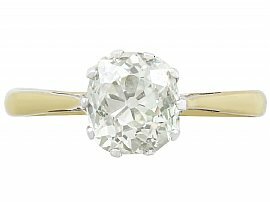 This fine diamond solitaire engagement ring has been crafted in 18ct yellow gold with a vintage platinum setting. The 18ct yellow gold solitaire engagement ring displays an antique 1.83 ct old European cut diamond held in a sympathetic ten claw platinum pierced decorated basket style setting. The pierced decorated elevated tapering ring shoulders blend seamlessly with the plain 18ct yellow gold, hallmarked to the interior of the shank with full English hallmarks; The gold guarantee mark (crown), 18 ct gold fineness mark (750), London Assay Office hallmark (leopard's head) and the date letter for 1976 (b). This impressive diamond ring is supplied with an independent diamond grading certificate. This antique yellow gold solitaire engagement ring is fine quality, set with a high colour graded old cut diamond. The 18ct diamond engagement ring is in excellent condition with clear hallmarks to the interior of the shank. Height of setting 7.9mm / 0.3"